Hello everyone, I hope you've all had an absolutely fabulous weekend. I'm properly back to uni now after an almost 5 month long Summer and I definitely feel more motivated than ever, although I need to work hard to plan my workload properly so if anyone has any tips or advice let me know! Homeware is something i'm constantly lusting over, there's just something about how buying a couple of new bits and pieces can really change the energy of a room. I always like to add a few new bits every so often but my favourite time of the year to shop for home ware is definitely around the end of the year. I personally looove decorating for Christmas so I feel like the run up to that, especially when the weather starts changing it's nice to have a change up of your home to make it all cosy and snug for the Winter. Candles: I feel like Autumn/Winter is the perfect time to invest in some new candles. Personally I love deeper, woody scents for AW and fresh, light scents for Spring/Summer. I am obsessed with the Yankee Candle Cinnamon Stick candle, it makes my room smell like i'm at a Christmas market which I love. But there's always so many amazing scents out this time of year so if you hate cinnamon, there will be something else for you. Autumn Decor: I do love adding some Autumn decor to my house. Places like TK Maxx and Homesense are amazing for finding items like this, I particularly love Autumn wreaths as I just find them so warm and inviting. I know things like this aren't for everyone as they can be a bit 'gimmicky' but I just find that it adds that warm, cosy, autumnal vibe. Mug: I'm actually not a big fan of hot drinks, i'll normally always opt for a cold drink rather than tea or coffee. However, this time of the year I get obsessed with lattes and hot chocolates so I always like to find a nice new mug to use. Vase: I love Autumn flowers and I know a lot of people don't like fresh flowers in their house, but you can get some amazing faux flowers if you don't want to buy fresh ones all the time. I feel that having a new vase is just a nice addition for sprucing up a room. 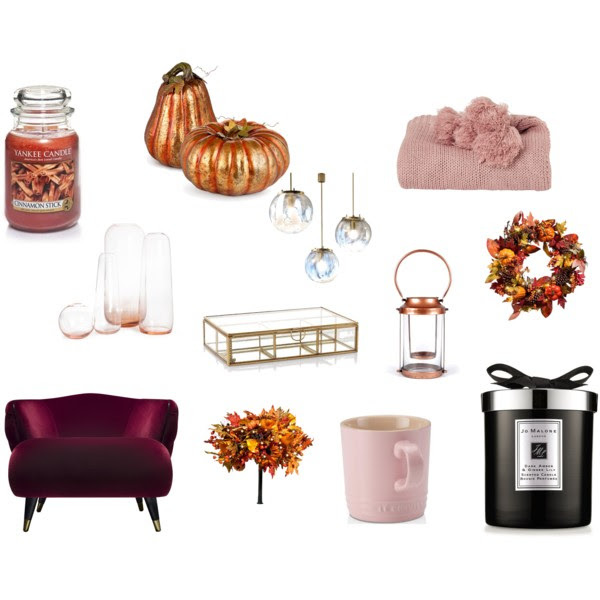 Velvet Seating: I am obsessed with this colour, I'll go into more detail later about the colour schemes i'm loving for this Autumn/Winter, but burgundy is a colour which i'm obsessed with. I feel like buying new furniture is a big commitment to make, but a statement piece of furniture will completely change the life of a room. Trinket Box: I just love little pieces like this as they're so delicate and affordable. If you're like me, I love to change up my style around September to get ready for the colder season and that means new jewellery. A new trinket box is perfect for storing delicate items which you know you aren't going to wear during Winter but you want to keep them safe. Blanket: When it starts getting colder, there's nothing better than a cosy blanket which you can just snuggle up with and take around the house with you. They're super affordable and can really change the dynamics of a room, and they just add that cosy, inviting feel to your home. Lantern: I feel like lanterns are appropriate for all year round, but particularly around Winter time as they just add a really cosy, warm vibe to your home and you can fill them with either tealights or a big candle, or you can just leave them empty and they still look lovely. Lighting: Particularly around Autumn and Winter your house can start to get really dark because of the lack of natural light, so investing in a lamp or changing your lampshades can really make a difference and really warm up your home. I particularly love brass lamps and glass lampshades at the minute as I just find them so beautiful and they can be really affordable whilst looking luxe. I know some of these colours would never go together in a million years, but I feel like interjecting some of these colours into your home will just add a bit of life and revitalise your interior. 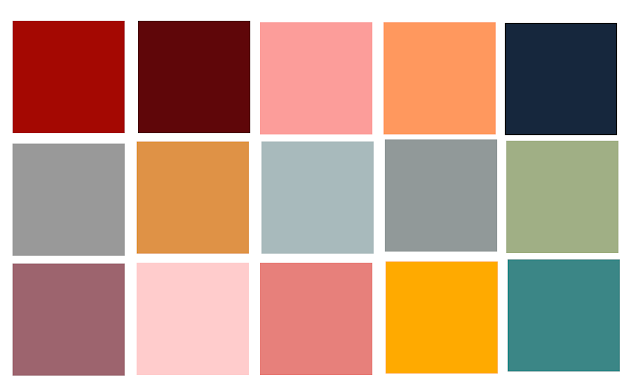 My favourite shades for AW17 are probably the millennial/blush pinks, burgundy, navy blue and the grey shades. This season i'm still deeply in love with rose gold and copper, but also velvet and brassy tones and textures. I hope you guys enjoyed this post, I'm just super obsessed with home ware recently as I keep seeing so many things I want to buy and I'm desperate to change up my bedroom a little bit. Is there anything you've seen recently which you feel would make a great addition to you home? I hope you all have an amazing rest of the week!